ADIAS - What's new ? The Abu Dhabi Islands Archaeological Survey (ADIAS) undertakes data collection and preliminary recording of archaeological and palaeontological sites and publication of its earlier and continuing work, both in Abu Dhabi, and, through associates, elsewhere in the United Arab Emirates. This work is undertaken both as part of a continuing research programme and as contracted work for consultancy companies and others prior to the carrying out of development projects. Two papers reporting on ADIAS work have been published in the latest issue (Vol. 16.1) of the Abu Dhabi-based journal Tribulus. Hellyer, P. and S. Aspinall, 2006. "An archaeological and ecological curiosity - Terebralia palustris (Linnaeus, 1767) in the north-east of the Emirate of Abu Dhabi." Tribulus 16.1: 10-13. Kallweit, H. 2006. "A new type of tool from Umm az-Zamul Neolithic sites." Tribulus 16.1: 14-15. Results of a third season of fieldwork in the deserts of south-eastern Abu Dhabi, undertaken by an ADIAS team in collaboration with the Department of Antiquities and Tourism in Al Ain, part of the Abu Dhabi Authority for Culture and Heritage, were presented in a paper delivered at the annual Seminar for Arabian Studies in London. 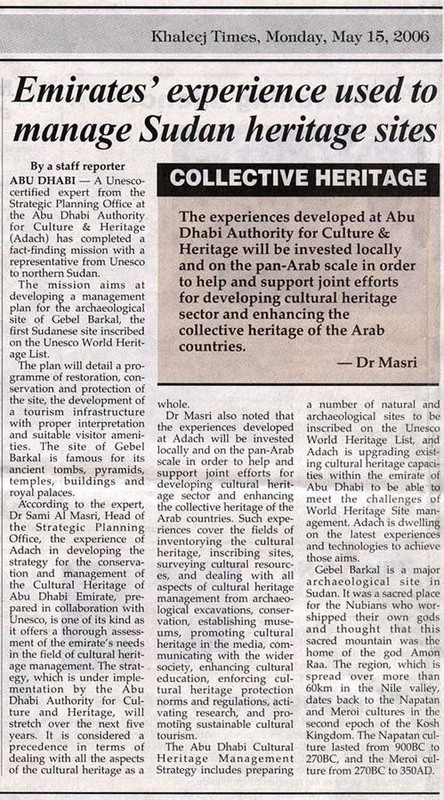 The former Senior Resident Archaeologist of ADIAS, Dr Mark Beech joined the Abu Dhabi Authority for Culture and Heritage (ADACH) as Head of Division - Cultural Landscapes. Dr Mark Beech participated in the Symposium on the "Status and Conservation of Dugongs of the Arabian Gulf, Red Sea and Western Indian Ocean", organised by the Environment Agency in Abu Dhabi, and sponsored by Total. The event was held at the Beach Rotana Hotel in Abu Dhabi. He presented a paper entitled: "An archaeological perspective on the exploitation of dugongs in the Arabian Gulf". Although the dugong is today a protected species they have been exploited by humans as long as 7500 years ago in the Arabian Gulf. This paper discusses the archaeological evidence for their exploitation. It highlights the sites and locations where dugong remains have been discovered and provides a historical synthesis of the relationship between human populations and dugongs in the region. Beech, M., H. Kallweit, R. Cuttler and W.Y. Al-Tikriti. 2006. Neolithic sites in Umm az-Zamul. Bulletin of the Society for Arabian Studies 11: 17-26. [ to download this article in Acrobat .pdf format click here (1.67 MB) ] . Dr Mark Beech participated in the International Symposium "Archaeology of the Arabian Peninsula Through the Ages", held at the Intercontinental Hotel in Muscat, Sultanate of Oman. To download further details about the symposium click here (pdf - 994Kb). ABSTRACT - This paper will discuss two ongoing projects of the Abu Dhabi Islands Archaeological Survey (ADIAS) which shed new light on the Neolithic period in south-eastern Arabia. 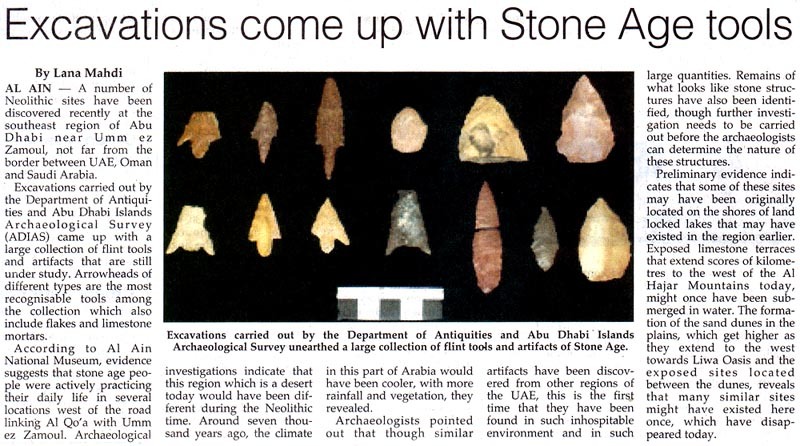 Firstly, recent excavations on Marawah Island located some 100km west of the city of Abu Dhabi have revealed traces of a very important early neolithic settlement dating back to the mid 6th millennium BC. The site, known as MR11, consists of a series of large impressive stone buildings. Interesting finds include imported Ubaid pottery from Mesopotamia, locally made plaster vessels and pearl oyster buttons. Secondly, recent survey work and excavations in the Umm az-Zamul region located in the south-east of Abu Dhabi emirate, not far from the borders of the Sultanate of Oman and the Kingdom of Saudi Arabia, have uncovered new evidence for neolithic settlement within the Rub Al-Khali. The results of recent survey and excavation work will be presented. These and other findings will be discussed in comparison with material found at early prehistoric sites located in the Sultanate of Oman. The new evidence provides an intriguing insight into life in south-east Arabia at this time. ADIAS attended the Fourth Annual Symposium on Recent Archaeological Discoveries in the Emirates, held at Le Mercure Hotel on Jebel Hafit in Al Ain. Click here to see details of the programme and to read abstracts of the papers presented. "Umm al-Ishtan and Bida al-Mutawa: new Late Miocene fossil sites in the Western Region of Abu Dhabi Emirate" by Dr. Mark Beech (ADIAS), Dr. John Stewart, (University College, London) and Dr. Heiko Kallweit (ADIAS). "Investigating the Desert Neolithic: a report on the 3rd season of archaeological survey and excavations at Umm az-Zamul, Abu Dhabi Emirate" by Dr. Heiko Kallweit (ADIAS), Richard Cuttler (Birmingham University), Dr. Mark Beech (ADIAS) and Dr. Walid Yasin al-Tikriti (Department of Antiquities and Tourism, Al Ain / ADACH). Dr Mark Beech was invited by Shehab Shehab, Director of the National Museum in Kuwait, to participate in the joint Kuwaiti-Slovak Archaeological Team working on Failaka Island. The team is currently excavating an important Bronze Age/Dilmun period settlement at Al-Khidr, located on the north-west coast of the island. During this visit he carried out collaborative work on the animal bone assemblage from Al Khidr, together with Zora Miklokova from the Institute of Archaeology, Slovak Academy of Sciences. Discussions were also held with Dr Mohsen Al-Husaini from the Kuwait Institute for Scientific Research (KISR) concerning the progress of the joint marine catfish otolith research project. Beech, M. 2006. Book review of "Reef Fishes: UAE and Gulf of Oman" by Richard Field. Dubai: Motivate Publishing, in Tribulus (Journal of the Emirates Natural History Group) 15.2: 30-31. [ to download this article in Acrobat .pdf format click here (249 Kb) ] . Beech, M. 2006. Book review of "The Early Dilmun Settlement at Saar", edited by Robert Killick and Jane Moon, London-Bahrain Archaeological Expedition Saar Excavation Report 3. xii+367 pages, 536 colour illustrations, tables. 2005. Ludlow: Archaeology International; 0-9539561-1-3 hardback" in Antiquity 80 (No.307, March 2006): 227-228. [ click here to visit the Antiquity website and to read the article ] . Beech, M. and E. Glover. 2005. The environment and economy of an Ubaid-related settlement on Dalma island, United Arab Emirates. Paléorient 31/1: 97-107. [ to read abstract click here ]. Beech, M. and M. Al-Husaini. 2005. Preliminary report on the vertebrate fauna from site H3, Sabiyah: an Arabian Neolithic / 'Ubaid site in Kuwait. In: H. Buitenhuis, A.M. Choyke, L. Martin, L. Bartosiewicz and M. Mashkour (eds. ), Archaeozoology of the Near East VI: Proceedings of the sixth international symposium on the archaeozoology of southwestern Asia and adjacent areas. ARC Publicaties 123. Groningen, Netherlands. pp.124-138. [ to download this article in Acrobat .pdf format click here (3.12 MB) ] . Added new stories to the press page: ADCHA board of directors named (Source: Khaleej Times) and Khalifa names Abu Dhabi Culture and Heritage Authority board (Source: UAEinteract.com). Added new stories on the press page: Khalifa names ADCHA's board (Source: WAM - Emirates News Agency) and ADCHA board holds its first meeting (Source: WAM - Emirates News Agency). An ADIAS team carried out fieldwork at Umm al-Ishtan in the western region of Abu Dhabi. The ADIAS team included: Dr Mark Beech (ADIAS Senior Resident Archaeologist), Dr John Stewart (Department of Biology, University College London, U.K.), Dr Heiko Kallweit (ADIAS associate and Freiburg, Germany) and Roxana Mclennan (ADIAS associate, Abu Dhabi). Mapping and excavation of a newly discovered fossil site near Umm al-Ishtan, presumed to be Late Miocene in date, was undertaken. A number of important fossil specimens were successfully excavated and transported back to Abu Dhabi. These include almost complete specimens of elephant radius and femur, as well as a large pelvis fragment. 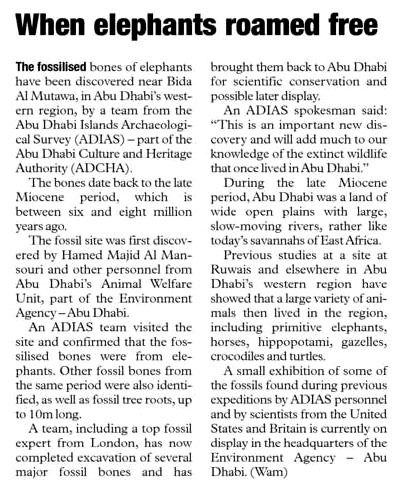 In addition, a new fossil elephant trackway site was "discovered" close to Bida al-Mutawa. An ADIAS team carried out fieldwork on Sadiyat island. The island is located just to the east of the capital city of Abu Dhabi. A new tourism development project is being developed there under the control of the Abu Dhabi Tourism Authority (ADTA). The ADIAS team included: Dr Mark Beech (ADIAS Senior Resident Archaeologist), Dr Heiko Kallweit (ADIAS associate and Freiburg, Germany), Richard Cuttler (ADIAS associate and Birmingham Archaeology, University of Birmingham, UK), Phil Glover (ADIAS associate, Abu Dhabi) and Roxana Mclennan (ADIAS associate, Abu Dhabi). Detailed mapping was undertaken of two main areas of archaeological interest on the island. Archaeological features recorded include hearths, shell middens, pottery scatters and occupation mounds. The majority of the pottery appears to date to the Late Islamic period, although analysis is still underway on the assemblage. A report is currently in preparation on the results of this work. Co-directors: Dr Mark Beech (ADIAS Senior Resident Archaeologist), Dr Heiko Kallweit (ADIAS associate and Freiburg, Germany) and Dr Walid Yasin Al-Tikriti (Department of Antiquities and Tourism, Al Ain). Team members: Richard Cuttler (ADIAS associate and Birmingham Archaeology, University of Birmingham, UK), Suzan Al Mutawa (ADIAS researcher), Phil Glover (ADIAS associate, Abu Dhabi), Roxana Mclennan (ADIAS associate, Abu Dhabi), Hamed Al-Mutairi (Department of Museums and Antiquities, National Council for Culture, Arts & Letters, Kuwait) and Ahmed Abdullah Elhaj (Department of Antiquities and Tourism, Al Ain).